Our private tour guide Yaakov “50 shades of Yaakov” Shabat didnt see it coming. He thought it was just another tour group. 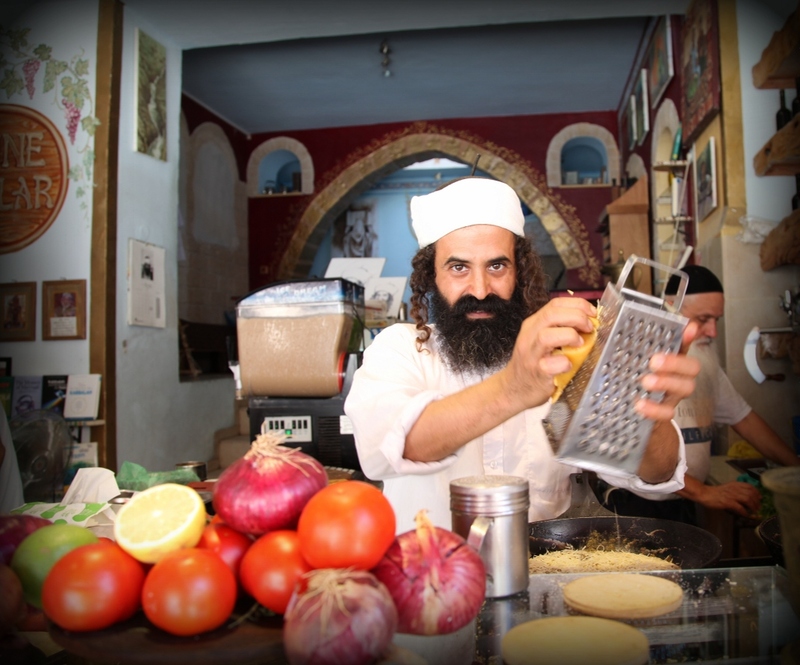 Instead of making a right in the colorful Akko shuk and head toward the next attraction and the legendary Uri Buri, I threatened mutiny if we dont make a left first for a pre-dinner snack at a local hummus joint. Yaakov was about to find out that we were not there just to see what the Crusaders built, but also where the crusaders bought Hummus, and how did they eat it? With a spoon or pita? Did they use plastic or silver spoons? 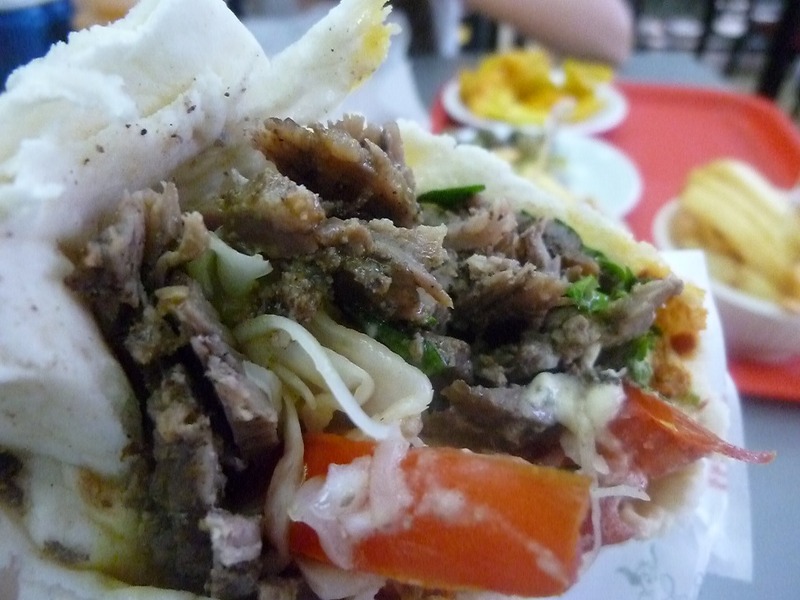 And if they used pitas, did they scoop it with circular, straight or snake motion (this is for you Moti). Anyway, we started our guided tour with perhaps the best hummus we ever had. Here’s more on that and the rest of what we ate in the north. Most of these werent random stops btw. I’ve done my fair share of research before the trip and the results were outstanding. 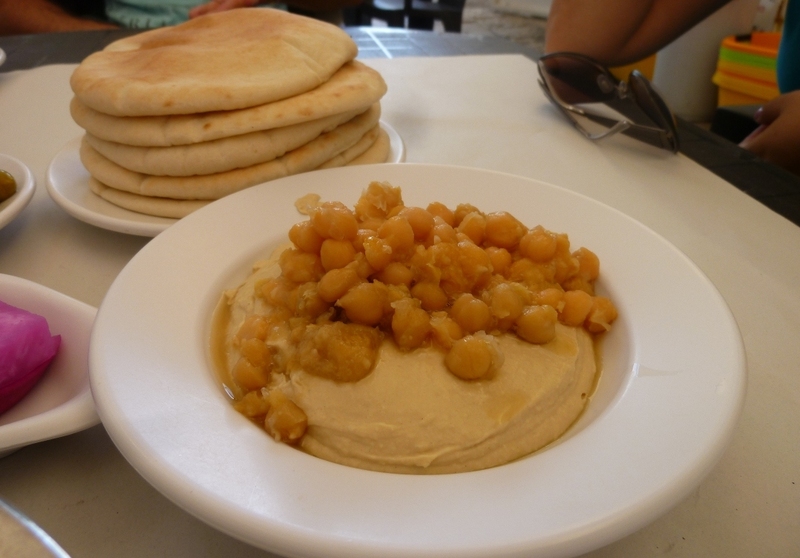 The hummus, silky smooth, creamy, fresh, served warm with boiled chickpeas. A really excellent, ‘no frills’ simple hummus! In a business dominated by men, 2 sisters working hard to maintain their father’s legacy and they know what they are doing. Akko – Uri Buri. 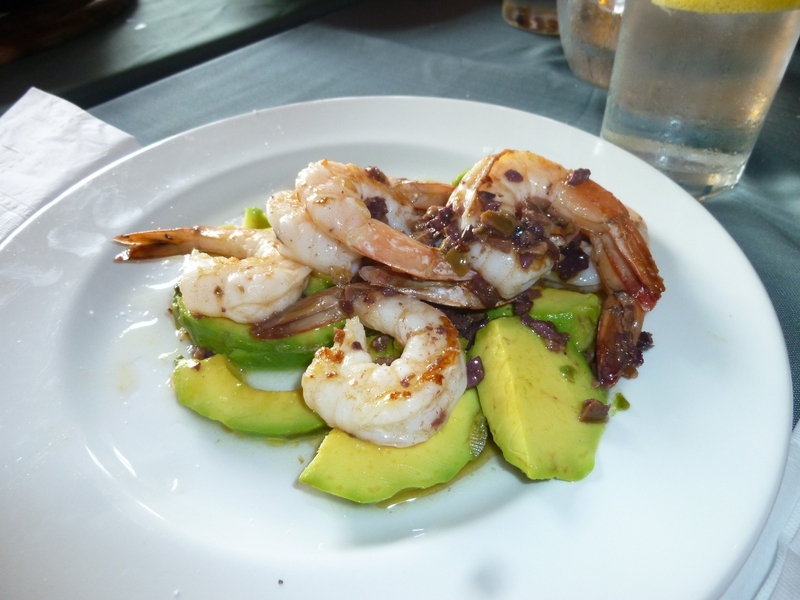 This was one of those meals, at one of the most famous seafood eateries in in the country. Uri Yirmias the owner is a food celebrity in Israel. 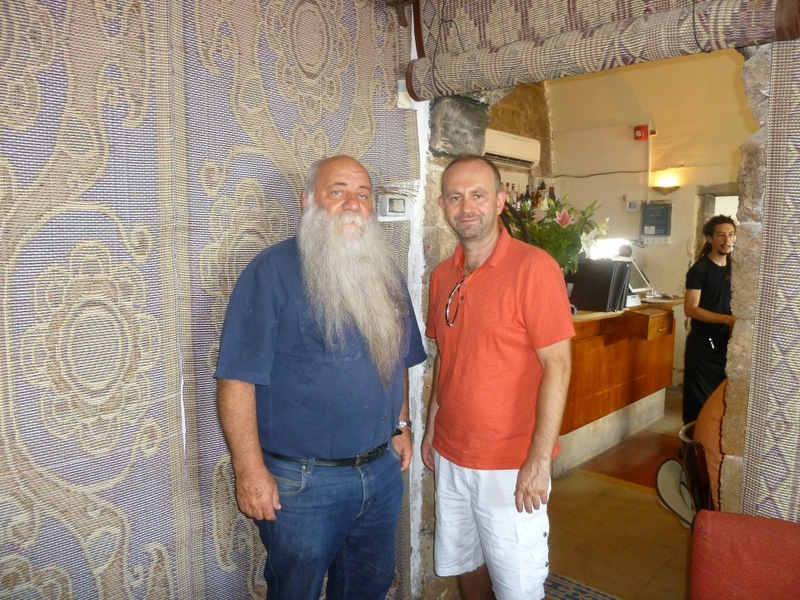 Had a little chat with the legend who was very enthusiastic about his new venture, the recently opened Efendi hotel. He also owns an ice cream parlor next door, written a cook book, partner in another super popular eatery Helena in Caesarea, and he’s also an emergency call up for ZZ Top. I think! My hebrew is somewhere between rusty to non-existant. Started with an array of starters (we are 7 adults btw). The standout and perhaps the most interesting item of the meal was the Sashimi salmon with wasabi sorbet, contrasting flavors that went nicely together. For main the Sea wolf and the Mediterranean shrimp were the standouts and the one memorable dud was surprisingly the St Peter’s fish appetizer. 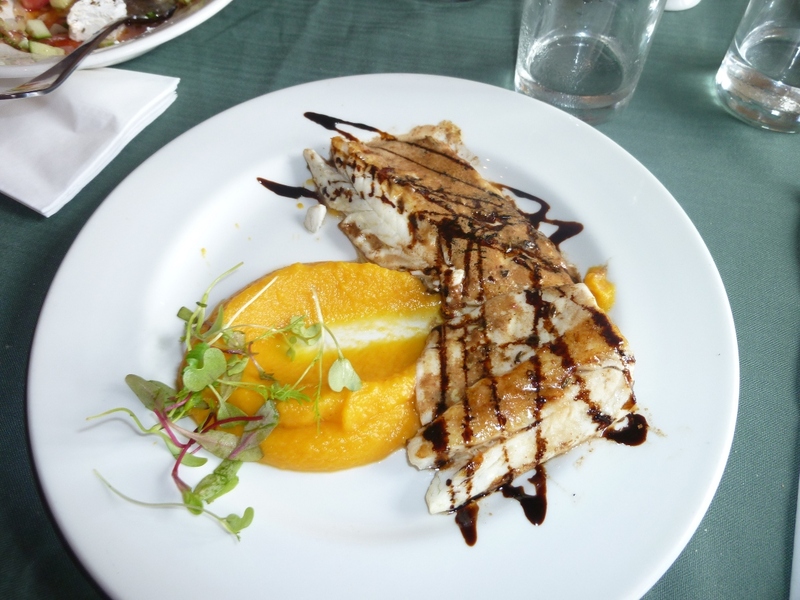 They allow half portions which I suggest taking advantage of as it allows you to sample more. The half portions are also big enough and do look like normal size dishes. 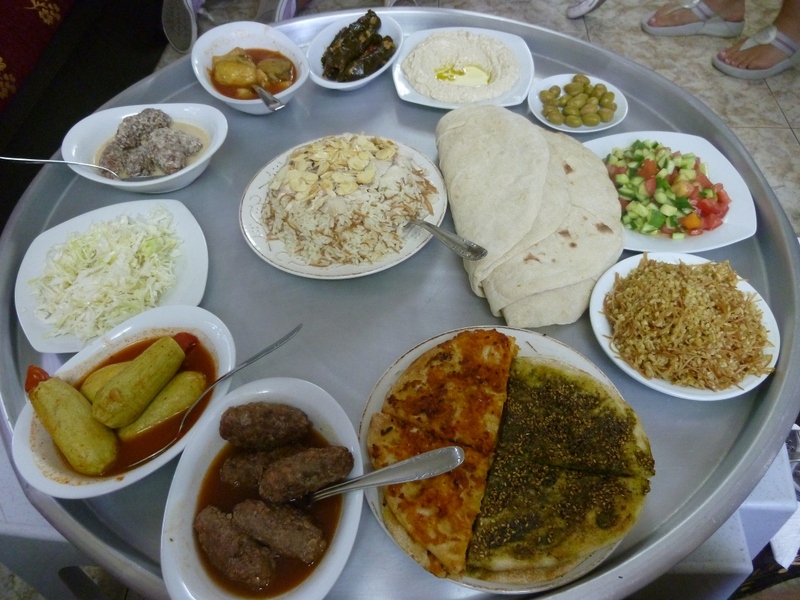 Haifa – Hazkenim Falafel. 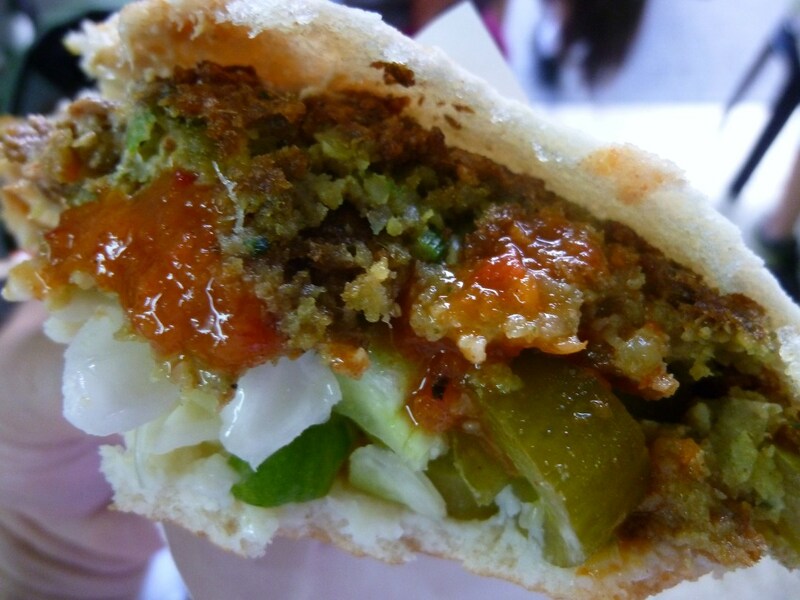 This is the best falafel in the country. How do I know? It says so right there on its sign, “Best Falafel in the country”. and while you are chewing on this one, turn around and there it is, Falafel Michel, “Best Falafel in the neighborhood” :shock:. And there’s not much else going on on this narrow alley except these 2 behemoths right next to each other competing for bragging rights. The initial plan was to try both but the plan didnt live long. 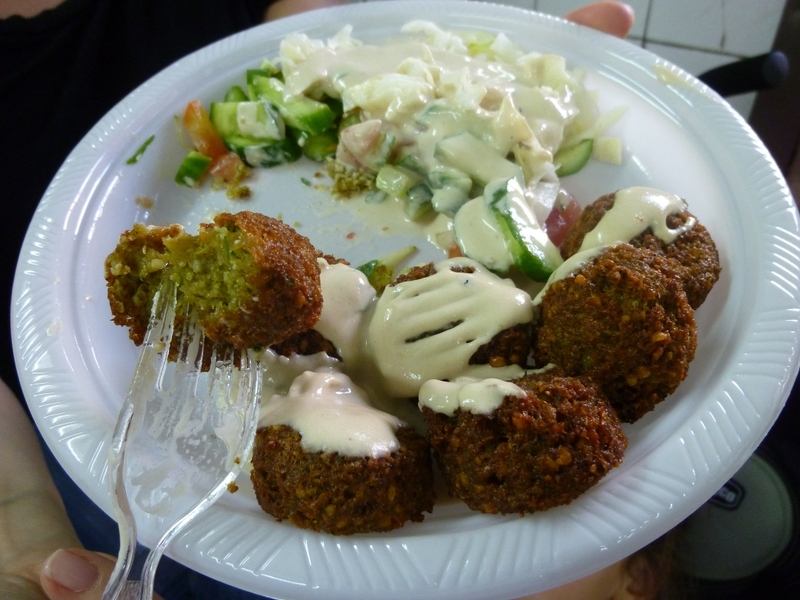 Hazkenim (means old people) totally blew us away with those flavorful, crispy balls of goodness. It had that perfect color on the inside too. Not too yellow and not too green, which means the just the right amount of parsley, cilantro and what ever other herbs the use. The perfect Falafel! So filling we couldnt try the other one. Livnim – Roberg’s. Master chef Ilan Roberg’s hidden gem in the Galilee, 10 minutes from Tiberias and the sea of Galilee, perched nicely on a hill. This is kosher food at its best. 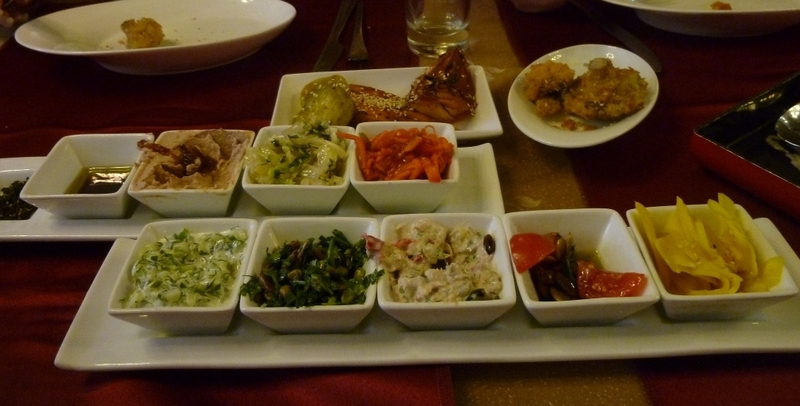 As is the case with many of the dining establishments we encountered, this was again all about the Mezzes, a plethora of delicious small plates including tasty Pâtés, eggplant salads and more. And just when you ready for the main course, 2 pots of different soups are on the table. This is not much of a seafood place. The mains here are mostly unique chicken dishes. The chili and coconut marinated chicken skewers in particular was tender and tasty. Other inventive dishes like chicken with peanut butter were satisfying. 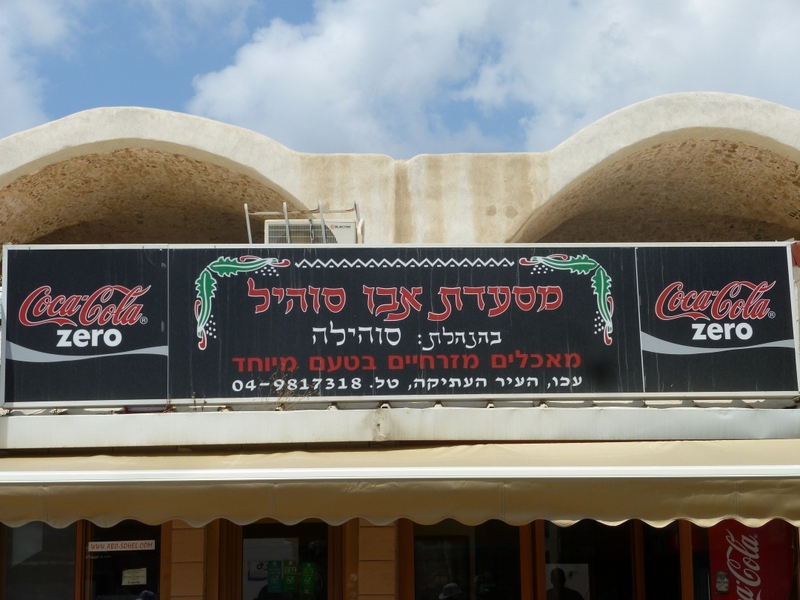 Dag al Hadan – A trout farm in the upper Galilee serves.. you guessed it… Hummus. Among other things like the tasty smoked trout dip. The setting here is the main draw as you are sitting right next to the gushing Dan river. Oh they also serve some pretty good trout. No filet, you get the entire trout. They cook in 3 different ways. The baked one with pesto was the most memorable. Tzfat – Lachuch guy. Lachuch is no ordinary fast food. 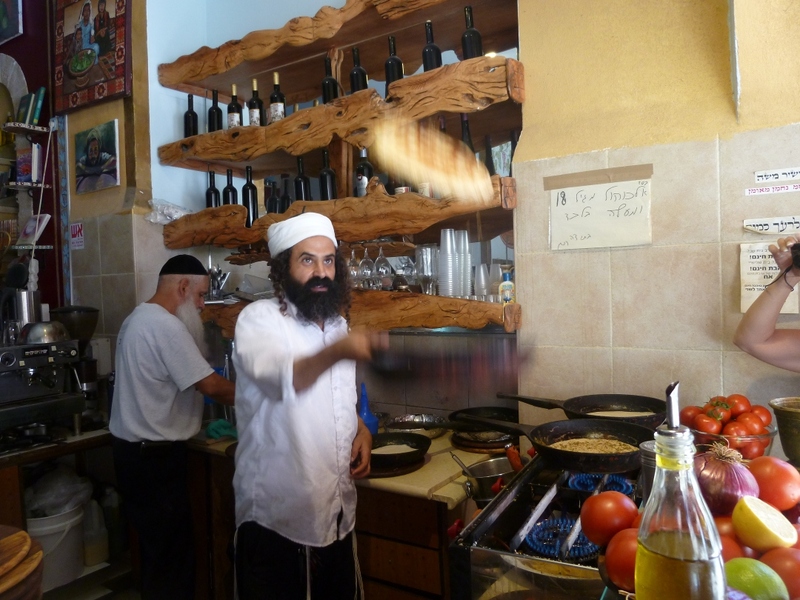 A Yemenite spongy flat bread made fresh by an enthusiastic fella wearing traditional yemenite attire. 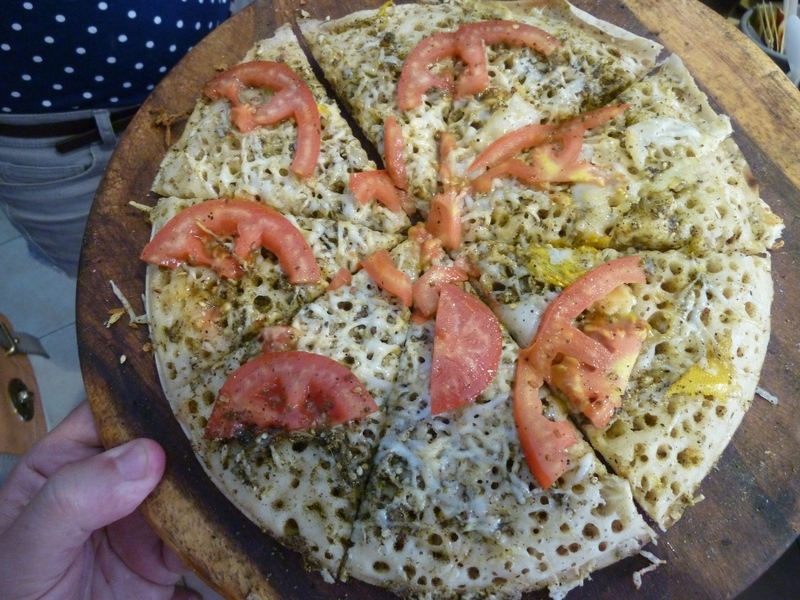 Add fresh tomatoes, grated cheese, zatar, onions and you got Pizza on crack. Add the fiery green Z’hug the have on the side and you got a pretty spectacular looking and tasting snack. What a find in Safed/Tzfat/Madonnaville. In the map below I believe I got the street correct at very least. If you are walking up in the market in the old city, its at the near end. Just look for the guy that looks like in the picture on top. His name is Ronen I believe. Special thanks to guide Oreet Segal for the last minute recommendation. 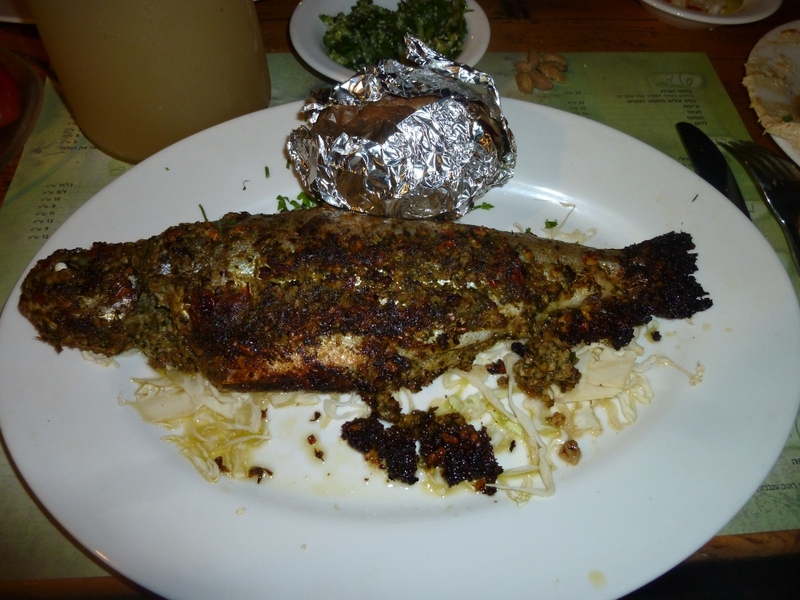 Al Basha in the Mahanaim junction near Rosh pina – an absolutely terrific lunch. Nice chicken shawarma, falafel, hummus and more. It’s amazing that you can even have great meals in the middle of nowhere here. Middle of nowhere in Israel by the way is 2 miles from the nearest city. Who said you can only eat well in Tel Aviv? ok, I said it, but still! Plenty of gems in the North. Post your favorites below and stay hungry my friends! That is IKEA’s slogan that never penetrated the US market and it means “A better night sleep.”. I slept well on Friday night because I ate in my favorite restaurant in NJ, after driving Ziggy and family to the airport. I may have been the only idiot since the store’s grand opening a decade ago that went to eat there and not shop and this wasn’t even the first time. When HWW (Hummus Whisperer’s Wife, or the (“Wife”) was expecting, I convinced her to go there just so we can eat (but never told her that). This time, to make sure no one finds me suspicious, I stood on line to buy 2 bibs for the baby behind a newlywed couple waiting to buy the Fyrkantig, the Nortviken, the Ramvik, and the Sleegensagen, just to name a few. Good luck in your “easy” assembly you fools, you’ll be back to return half of this junk next week! Been there, done that. Anyway, Ikea’s restaurant not only boasts one of the best views of EWR and surrounding highways, but also serves the best Kottbullar (aka Swedish meatballs) outside of Sweden (On a few occasions I tried wanna-be imitations at Swedish restaurants in NYC for three times the price.) The $3.99 Swedish meatballs with mashed potatoes are only a step behind Costco food samples in terms of value for the money but are a hearty and delicious lunch. The meatballs and mashed potatoes plate is above your average babushka-made meatballs, but what makes the dish is the sinful but tasty gravy cream sauce, but most significant is the genuinely tasty lingonberry jam. It was supposedly made from the lingonberries grown in Swedish forests that are picked while they cut down and steal the wood from the woodchucks living there. I just realized I forgot to pick up my favorite bathroom reading material, the IKEA catalogue. I’ll pick it up before I get Ziggy from the airport and will try the new baby back ribs meal. Who is the guy in the office who seems to always fall asleep while doing his thing at the urinal? He always puts his head on his arm against the wall and snoozes off. What does he have in common with the crazy woman on the bus who shouts in devil language and smacks her hand against the window and the seat in front of her, and then takes a nap? They both drink cup after cup of the cheap, flavorless, good-for-nothing office coffee that simultaneously makes them hyperactive sleepwhackers. They also don’t know about two hidden gems in downtown Manhattan that are often visited by yours truly and a dozen of lost tourists on a rainy day that are lucky to find these java treasures ahead of their shop-till-you-drop adventure at Century 21. Enter runner-up, Kaffe 1668, a unique well decorated establishment serving a fantastic choice of organic teas and a bold-flavored set of African and South American. Tried the delicious cappuccino, this isn’t the burnt and musty Starbucks, and enjoyed the high note and balanced flavors of the Ethiopian and Costa Rican. All three had fantastic aromas (very important if you have a slight hearing impairment and have a fetish for coffee smells and often visit Porto Rico Coffee Company – see my recent adventure with Ziggy). And the Winner is, Manon Cafe! What’s so special about this usually empty hole in the wall? Chocolate! You leave with a chocolate taste in your mouth that lasts longer than your strongest eau de toilette. You get a cup of Illy Italian coffee or cappuccino, with slightly subdued aroma, and a deeply dimensioned yet elegant taste. Accompanying this coffee, you get a choice of a free Leonidas Belgian Chocolate, dark or milk chocolate? It doesn’t matter which one you choose, this isn’t some cheap stuff made by Hershey, it’s a combination of coffee and chocolate that’s truly divine and makes you go Oooooooh!